Mol Med 2012 18, 336-45. TGX-221 purchased from Selleck. (E) TGX-221 treatment (0.5 μmol/L, 30 min) of control and FXS LCLs reduces PI3K activity as shown by a radioactive PI3K assay of p110β-specific immunoprecipitates from LCL lysates, and decreases PI3K/mTOR down-stream signaling as shown by strongly reduced phosphorylation of S6 independently of the genotype. (F, G) Quantification demonstrates a significant, dose-dependent effect of TGX-221 treatment on PI3K activity [F, competitive ELISA, n = 4, 2-way ANOVA, *P (genotype) = 0.0079, *P (treatment) = 0.0258, P (interaction) = 0.9418], and on S6 phosphorylation[G, ELISA, n = 4, 2-way ANOVA, *P (genotype) = 0.013), *P (treatment) < 0.0001, P (interaction) = 0.195]. (H) 30-min pretreatment of LCLs with 0.5 μmol/L TGX-221 significantly reduces protein synthesis in FXS patient cells [n = 40, 4 independent experiments, 2-way ANOVA: * P (genotype) < 0.001, * P (treatment) = 0.005, * P (interaction) < 0.001, Bon-ferroni post hocanalyses, * P = 0.001, #P = 0.002, ≠P = 0.02]. Example images are shown on the left: upper panel: signal for newly synthesized proteins (red), lower panel: overlay with tubulin staining (green). Scale bar is 20 μm. (I) Increasing concentrations of TGX-221 (5 μmol/L and 10 μmol/L) further reduce protein synthesis rates in FXS LCLs to healthy control levels. Saraswati Sukumar of Johns Hopkins University School of Medicine. TGX-221 purchased from Selleck. Breast cancer cells were pretreated with 100ng/ml EGF for 15 min and then treated with the indicated concentrations of TGX-221 for 24 hours. Dr. Zhang of Tianjin Medical University. TGX-221 purchased from Selleck. 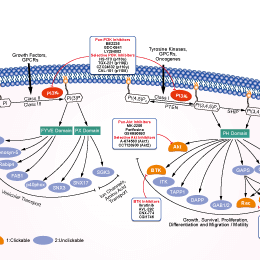 IC50 values are measured using a standard lipid kinase activity with PI as a substrate. (i)100 μM cold ATP is used instead of 10 μM, (ii) the DMSO concentration is 1%, and (iii) [γ-33P]ATP is used instead of [γ-32P]ATP. The TLC plates are quantified using a phosphorimager screen. The reported IC50 values are determined by non-linear regression analysis on the basis of at least three independent experiments repeated across multiple preparations of recombinant protein. Method: For measurement of proliferation, cells are seeded in triplicate in 96-well culture plates and incubated overnight to allow cell attachment. The cells are incubated with TGX-221 for 24, 48, and 72 hours. At designated time intervals, cells are quantified by a crystal violet staining-based colorimetric assay. Briefly, cells are fixed by addition of 100 μl of 2.5% glutaraldehyde solution and incubated at room temperature for 30 minutes. Plates are washed three times by submersion in PBS solution. Plates are air-dried and stained by addition of 100 μL of 0.1% solution of crystal violet dissolved in deionized water and incubated for 20 minutes at room temperature, excess dye is removed by extensive washing with deionized water, and plates are air-dried prior to bound dye solubilization in 100 μL of 10% acetic acid. The optical density of dye extracts is measured directly in plates using a microplate reader at 570 nm. Formulation: TGX-221 is dissolved in 10% ethanol, 10% cremaphor, 10% N,N-dimethylacetamine, 70% distilled water. Chaussade C, et al. Biochem J. 2007, 404(3), 449-458. Straub A, et al. Thromb Haemost. 2008, 99(3), 609-615. Lu XY, et al. Appl Microbiol Biotechnol. 2011, 89(5), 1423-1433. Bird JE, et al. Thromb Res. 2011, 127(6), 560-564. Jackson SP, et al. Nat Med. 2005, 11(5), 507-514.